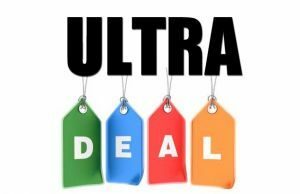 As of mid-2019, you can buy performance laptops with Intel Core i9 processors, mostly the Core i9-8950HK, part of the Intel Coffee Lake platform, but also the Core i9-9980HK (9th gen Coffee Lake-R platform) and the Core i9-9900K 9th gen desktop processor, which we’ll cover in a separate article. 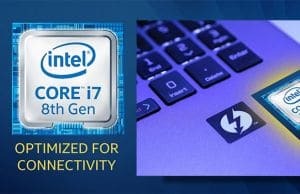 In this article we’ll tell you what to expect from the mobile Core i9 CPUs, how they compare to the mainstream Core i7s available in most multimedia and gaming notebooks these days, and whether (or rather when) these processors are worth your money, considering you’ll have to pay a significant premium for it. This aside, we’ve also compiled a complete list of the notebooks motorized by Core i9 processors that are available in stores, and we’ll update it in the months to come with new SKUs as they’re announced. Update: We’re updating the article with details on the Core i9-9980HK CPU and laptops built on the 9th gen Coffee Lake-R platform. Until that happens, in very few words, you should know that Coffee Lake-R is just a minor refinement of the existing Coffee Lake generation, with CPUs able to reach slightly higher Turbo Boost clock speeds, if allowed by the thermal implementation. 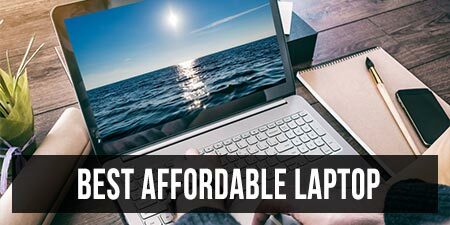 Of course, it comes to no surprise that most of these computers are hefty full-size desktop replacements, but there are also a few portable options to consider. 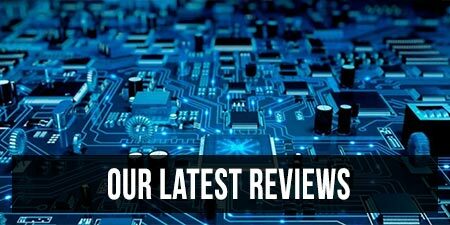 Just make sure to read proper reviews before taking the plunge on any of those, so you’ll find out if their cooling implementations are actually capable of keeping the i9 at bay. If not, it would make much more sense to just go with the more affordable i7 configurations. The i9-8950HK is the top-tier CPU in Intel’s Coffee Lake H line of performance processors for mobile computers. It gets 6 cores, 12 threads, 12 MB of cache memory, a standard frequency of 2.9 GHz and a maximum Turbo Boost frequency of 4.8 GHz (we’ll get to that in a bit), and supports up to 64 GB of DDR4 2666 MHz of dual-channel RAM. The K at the end of the name means this processor gets an unlocked multiplier and is thus, overclockable, which means that if the cooling implementation allows, it can run at higher than stock speeds. The table below shows how it compares to the mainstream Coffee Lake i7-8750H, as well as the Kaby Lake i7-7820K that it supposedly succeeds. Aside for the increased amount of cache compared to the i7s, the i9 also gets Thermal Velocity Boost (TVB), which in Intel’s words “opportunistically and automatically increases clock frequency up to 200 MHz if the processor temperature is low enough and turbo power budget is available”. Hence the 4.8 GHz maximum Turbo Boost (*). According to Intel’s slides though, the “low enough temperature” is of only 50 C, which means the i9 most likely would only clock to 4.6 GHz sporadically and for very short bursts at the beginning of complex loads, otherwise maxing out at 4.6 GHz. 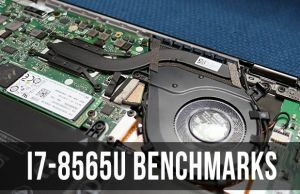 Even so, that’s higher than the 6-core i7-8750H can reach, and as long as the implementation keeps temperatures and throttling at bay, we can expect the i9-8950HK to offer a significant boost in performance over the more mainstream option, even without overclocking. 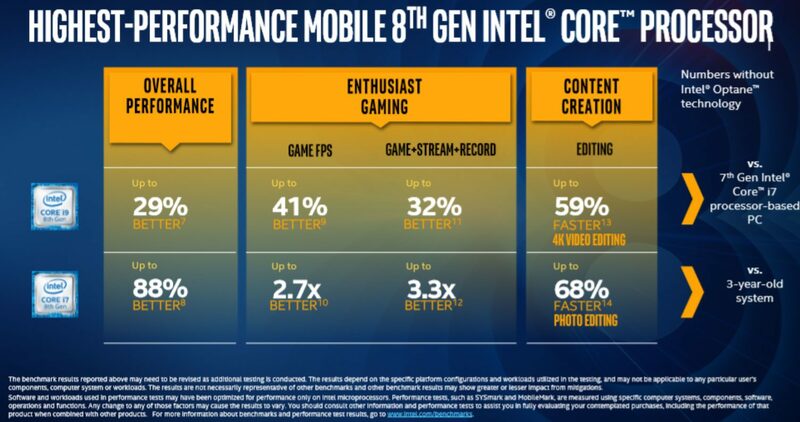 Speaking of performance, Intel advertises the i9-8950HK in comparison to the older i7-7820HK, claiming up to 29% better overall performance, as you can see in the picture below. I find it far more interesting how the i9-8950HK fares against the i7-8750H though, but the performance greatly varies base on each SKU, as it’s highly dependent on the cooling implementation. Still, the table below gives you a ballpark idea of what to expect (the results are based on our tests of the 8750H and these scores of the 8950HK). This section includes a list of the portable notebooks that can be configured with a Core i9-8950HK processor. 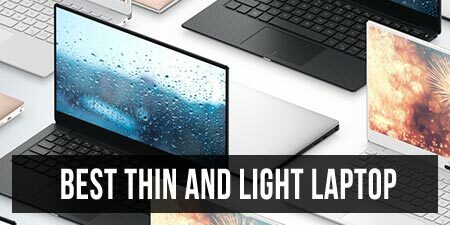 There’s a lot of hype around the i9 not performing as well as expected inside these thin and light laptops, and for the most part that’s true and should come to no surprise. If you’ll look into the MacBook Pro, XPS 15 or the Zenbook UX580 reviews, you’ll see that the i9 cannot maintain its high Turbo Speed frequencies with continuous demanding loads in these computers, and in some cases performs even worse than a regular i7 Coffee Lake build. 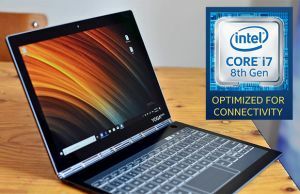 For the most part, though, the i9 offers only a slight performance boost over the i7, but not what you can get from this processor in a thicker laptop with a more complex cooling system. 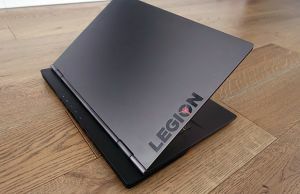 So while it would be a mistake to draw any general conclusions on this matter, I would suggest carefully considering if the i9 configurations are worth the significant premium OEMs ask for in these ultraportables, as well as carefully looking into detailed reviews that take a close look at the performance in the scenarios you’re planning to use the notebooks yourselves. There’s a good chance you’ll get similar or nearly similar results with the i7s, for a fraction of the cost. This section includes the full-size Core i9 notebooks. Expect most of these to be hefty and heavy, with very few exceptions, but at the same time, they will squeeze the most out of the hardware inside and allow for tweaking and overclocking. 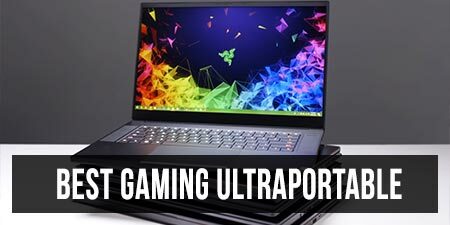 Most of these laptops are also extremely noisy with gaming and demanding loads, to the point where you’ll need headphones for comfortable use, which is somewhat understandable on the few thinner models, but hard to accept on the chunkier ones. That’s about it for now, but we’re constantly updating this list of Core i9 performance laptops, so make sure to check back from time to time for the latest additions. And get in touch in the comments section if you have any questions, or if you spotted a notebook that should be in here and we haven’t yet added. Second table down in the far right title column should read i9-8950HK not i7-8950HK. You forgot the Thinkpad P52 with up to 128GB RAM. I can't find any configurations of the P52 with the i9, it's either the i7 or the Xeons. Do you have any links that would suggest otherwise? hey, just a small correction. the thinkpads (p1 and x1 extreme) only have 2 ram slots i believe, that's all. thanks for the list! Thanks for this round up. Helpful! I still find the Mac to be a greater value. Especially the 2018 model with the i9/i7 with 32GB RAM. Superior SSD bandwidth with fusion for virtualization. For those like me who want to run numerous VMs and build data-center parity with shell script support, or even run docker swarms and orchestration in addition to iOS/Android app development, there just isn't a parallel. With brew and top notch shell support, I fail to see the value in other offerings. A lot is possible with Windows too, but it just isn't Unix.